Mac Users Mourn The PowerBook. While not technically dead, the venerable PowerBook’s days are numbered, as the awfully-named MacBook Pro is set to take its place. Throughout the Macintosh community, PowerBook users and lovers have expressed their deep sentiments of loss in the past several days over Apple’s erstwhile professional laptop. In a tasteful ceremony earlier today, former PowerBook user Steve Rutter buried his beloved laptop in his back yard, marking the spot with a simple white cross. Between tears, Rutter said “I… I can’t believe it’s gone. It was a 1.5 GHz aluminum model and still seemed like it had so much life left in it. Walking slowly away from the grave with his head bowed Rutter stopped suddenly. 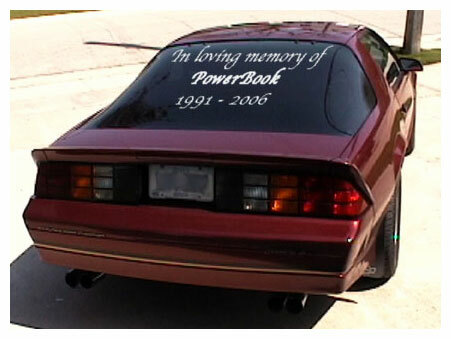 On the rear window of his 1988 Chevy Camaro, Shaker Heights, Ohio, resident Brad Schiff placed a tribute to the PowerBooks he’s owned over the years. Schiff began to choke up as he continued his litany. Suddenly getting a wild-eyed look, Schiff threw the bottle away. Apple declined to comment on whether or not the MacBook Pro heard Schiff. Previous Previous post: Intel-Based Macs To Have "Intel Inside" Logo. Next Next post: Wall Street Analysis of Apple Handled By Sullen Teens.